Electrified Ringlock! I fenced a previous farm like this (and it worked a treat). Now I intend to re-fence our home property similarly. I will pin 30cm rabbit-proof netting to the bottom earth wires and to the ground inside. The grass will grow through it and anchor it. After that nothing will come through (or under) this fence, neither animal nor human vermin. Birds can clearly fly over it to a safe refuge. Eventually I will place nest boxes on all my strainer assemblies. Similarly small animals (possums, antechinus etc) will fit through or climb over the weldmesh gates. The gates need to be quite tight-fitting and have a pipe or pole buried under them. Our sheep will be unmolested and raise their lambs without fox predation. It will take a while. 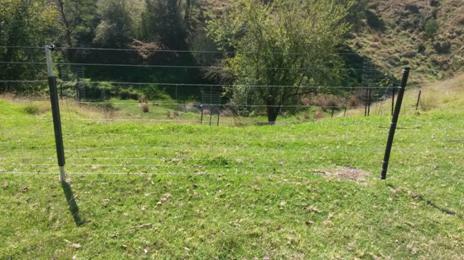 I have quite a few kilometres of fence to replace over the years; this was just the first. The plastic elements are from DM Plastics. I think you could just use a number of Pinlock insulators (three?) instead of the triangular sleeve – it may also be cheaper. NB: At the moment (August 2017) the triangular star post insulators are unavailable. Instead you can use a pinlock insulator on the top and bottom wire and a section of 2″ poly pipe between. This works just as well, at least on flattish ground. – and is cheaper! You can attach the netting to the poly pipe with a length of wire.